Hey Everybody! Remember Malcolm, the wonderful guy who saved my life? Well this is Dr. Jean Grey and she adopted Malcolm in Mexico. She had kittens yesterday. Go check it out and offer him some Concatulations here! 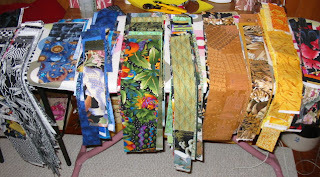 Now that you have all those long pairs of strips, you cut them into smaller pieces. 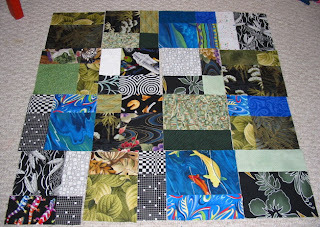 Since the kitty quilts are 24" square, Mom wants blocks 6" x 6" so she can use 16 of them in 4 rows of 4 to make the quilts. 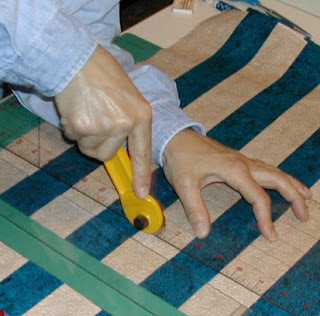 She cuts each strip into 3 of each of these sizes: 2-1/2"; 4-1/2" and 6-1/2". She does this to all the strips she has sewn. She ends up with big stacks of chunks, like these. Many strips have to be trimmed at one end so they are straight, so there are lots of leftover little pieces that aren't good for anything. She tosses these in a basket. For me. This picture of Gizzy was taken on Sunday while Mom was working on finishing some quilts so they can go flying out of here. As you can see he doesn't look too happy. He keeps going onto the work table and meowing for Mom. She actually gave him a sponge bath. He doesn't like it when I try to play, and today he hissed and growled, and then he hit me. If he is napping, and I don't pester him, I can nap next to him. But Mom spends time with him in her lap, and he sleeps next to her all night. He hasn't gained any weight, either. Mom's been trying to give him stinky goodness in her room with the door closed. I don't think this is fair, so I wait on the other side of the door, and try to get it open. But no matter how politely I ask, no matter how loudly I beg, she won't give me any. And every time Gizzy goes near her and mews in a squeaky little voice, she takes him somewhere and gives him some stinky goodness. And even though I personally think this is way Too Much Information... she wants me to tell you all that Gizzy DOES use the litter box, and he is QUITE STINKY about it, so he obviously isn't blocked. OK, I'm not moving. 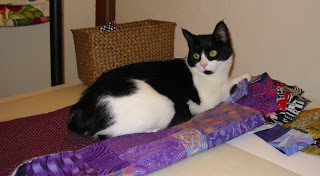 But Mom watched some guy named Oscar on the picture box last night while she worked on finishing several kitty quilts. Here I am supervising. Some cats have expressed an interest in me leaving my smell on these. So I have had a job to do. 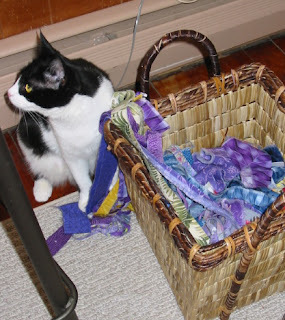 Here I am making sure this particular quilt is properly pre-scented. A few very lucky cats will get quilts with Gizzy's scent. Since he's a Senior Cat, he works when he wants to. Mom says quilts will start flying out of here tomorrow. I wanna see that. I found this at Bonnie Underfoot & Victor Tabbycat's and thought I'd play along. Dr *****, next town over from here. A new home for Jasmine - far away from me. You know the drill. Copy this list and paste it into a new post. Insert your own answers, pass it on, and leave me a comment. I like comments. Yes, it's long. So skip some questions - you're a cat and don't have to do what anyone tells you. This is the first of the "Qwiltz" (as Skeezix calls them) that is completely finished. Mom has been working making tops; now she is finishing several at a time. Starting soon they will be flying to cats all over the country. This one is going to Chicago, but others will be flying to Catifornia, Mew Jersey, Whiskeronsin and Floripaw. Check out the backing of this quilt. Mom says that you can ask for your preference of colors on the TOP of the quilt, but she's gonna pick something for the back, so expect surprises. She's finally got the PayPal thing worked out, and you won't need a PayPal account to use it. Those of you who contacted me will be getting an email. If you have not yet ordered a kitty quilt and still wish to do so, email me at DarlingMillie AT Gmail DOT com with all the particulars. 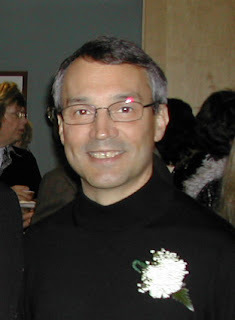 This is Mom's brother, who lives Far Away. 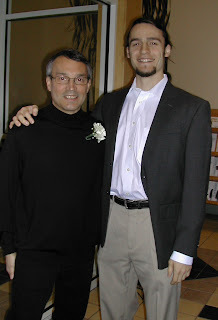 Mom's brother and Mr Karate. This is Mom and her Niece, the Pretty Girl, who is 9. Mom spent so much time talking to everybody she forgot to take more pictures. Gizzy, Jasmine and I teleported over to see the show. We were perfectly dressed for the occasion as many Artists wear black. We checked out the artwork, which was beautifully hung, and then spent time at the buffet table. Jasmine had some bacon wrapped scallops, I chased a Swedish Meatball around before I caught and ate it. Gizzy had an empanada. We left before it got too crowded. Afterward, Mr Karate and Mom went out with some friends and had Martinis. Mom's brother and his wife and daughter are visiting from Far Away. Brother and Mom's Mom are having a two-person Art Exhibit that opens tonight. It is a Big Deal. A Special Event. This is Mom's niece. She is 9. 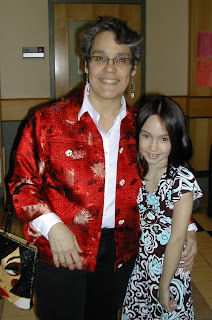 She loves animals and was very interested in meeting me. We played for a while. She wanted to pet me. I was a little bit afraid, so I kept my distance. After a while, she gave me some Beef Temptations. Smart Girl. I ate them from her hand. 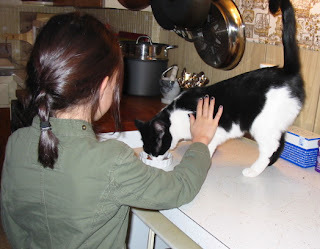 Then she and Mom fed all us cats, and I let the little girl, who is not a noisy sticky little person, pet me - as you can see. She is very pretty, and very sweet. Mom's not gonna be bizzy for Gizzy today. She has to shorten some pants for her brother, and sew the rhinestone buttons on the red silk jacket to wear to the Opening. Bizzy for Gizzy will resume on Saturday. 2. I can't tell you how many Mom has to make. 3. It's not 100. (Mom says "Thank Goodness") It's not 50 either. 4. I can't tell you who ordered them. 5. I am checking each one out very carefully. 6. Mom is trying to make every kitty happy with colors they will really like. 7. Mom's being Bizzy for Gizzy is really cutting into my playtime and Gizzy and Jasmine's lap time. 8. Mom likes doing this more than she likes doing the dishes. Ask me how I know this. 9. We got a box of boxes. Mom says that's for the quilts when they start flying across the country. I didn't know quilts could fly! 10. Nobody has asked for a Red quilt yet. 11. Nobody has asked for Brown either, come to think of it. Which is cool 'cause Mom really doesn't like brown. She calls it "Brrrrrrrrrrr-OWWW-n."
12. Mom has a piece of paper for each kitty with their name on it and what colors they want for their quilt. This is so Mom doesn't get confused-eded and the right quilts go to the right kitties. 13. Gizzy is really grateful. Now that the strips are all sewn together, you have to iron them. Mom presses the skinny side over like this. There's a lot of ironing. This is Gizzy and me romping around on Mom's worktable. The table is at an angle, in case you think it looks funny. Anyway, you can see how big I am getting. I'm almost as long as Gizzy. When I'm as long as Gizzy, am I gonna be a Millie or a Gizzy? Am I gonna be a Gizzy Millie or a Millie Gizzy? If I get to be as long as Gizzy is he gonna be a Millie? Will a Gizzy and a Millie be the same thing? Well a Gizzy will equal one Millie but Gizzy can't be the same as Millie because we aren't the same. He's Gizzy and I'm Millie. He's a boy cat and I'm a girl cat, and he's a geezer and I'm a still a little bitty kitty. If a Millie will be equal to a Gizzy then we could measure things in Millies. We could. But I still like measuring things in Gizzys. OK, if you think that was confusing, meet Speedy. Well, if that was Speedy, who is this Speedy? Mom says the two Speedys are gonna meet somehow. This I gotta see. Once the strips are cut, you sew them together. Mom sews a skinny one to a fat one to make pairs. But first she has to decide which to sew together. So she sets the two piles of strips next to each other and plays around with various combinations. When she's got them paired off and she's happy with them, she starts sewing. She uses a 1/4" seam and some neutral colored thread (that way she doesn't have to change it for different colored fabrics.) She sews them all together, and ends up with a big chain of them like this, on the floor underneath the sewing machine. Take good care of your sewing machine. Keep the bobbin area inside free of dust, and oil it regularly. If the needle hits a pin, replace the needle. Everybody always asks what kind of sewing machine Mom has. She just has a regular one that came from Sears 30 years ago. I love watching Mom work. I can watch her all day.... until I fall asleep or push a stack of fabric off the slippery angled table. And because you all want to know, Gizzy is eating and drinking, and is much more active than he was "before." Mom's really happy. Me too. Do cats get a prize for packing themselves into tight little balls when they nap? That's Jasmine up top on the pink pillow, and Gizzy in the cat hammock. 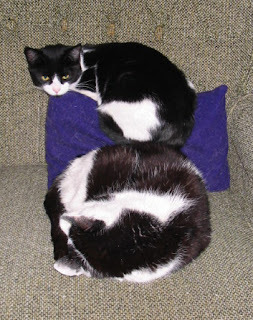 Here are a couple of kitty quilt tops. Both of these are spoken for. The red one is all sewed up, the green one is just laid out. Mom went out today and came back to find a hairball on the rug in the picture box room. It was the biggest hairball she had ever seen. It was as big around as her thumb, very tightly packed and over two inches long. Now let's think about that for a few minutes... Where could that have come from? And why was it so big, and WHICH cat upchucked it? Gizzy's feeling a lot better. Yesterday Mom had some Chicken Pounce treats. Gizzy kept nudging the bag, so she opened them and dumped a pile onto the table. You should have seen him gobble them down! We haven't seen him eat so enthusiastically in weeks! He even woke Mom up this morning at 6 AM, and he hasn't done that in months! When Mom got our dishes, she noticed something else unusual -- they were all empty! When she picked him up today, she thought he was a little heavier. He's been jumping around, and he's been a lot more active in other ways -- purring really really loud, and hissing instead of growling at me if I bother him too much. He seems to be acting more like his old self. Here's a picture of all three of us cats devouring those terrific treats Beezer sent. From the left: Gizzy, Jasmine and me. You can click the picture to biggify. Once you have your fabric all ironed, you have to cut it into strips. Mom uses a technique called "Strip piecing," where she cuts long strips, then sews them together, then cuts them apart and then sews them together to make "blocks" or what Mom calls "chunks." She doesn't cut individual squares. Everything has to be ironed first, and then the fabric has to be "straightened out" (I dunno what this means, but Mom says the sewers among you will know) and the ragged edge cut away. This takes time. She cuts strips from each different piece of fabric she has. For the kitty quilts Mom has been cutting strips of two widths: 2-1/2" and 4-1/2". Mom can spend a whole evening in the sewing room just cutting. Annie visited eQuilter and asked Mom what a "Fat Quarter" is. Fabric is sold by the yard. Cotton fabric is usually about 42" to 45" wide (and there are about 25 yards on a bolt). The smallest amount of fabric you can buy is usually a quarter of a yard (9"), so a quarter yard piece would be a piece 9" by about 45" wide. 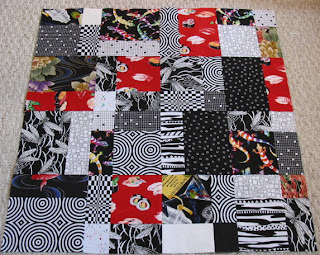 But 9" isn't very large, so quilt shops often cut half-yard (18") strips, then cut it crosswise into two pieces. Same amount of fabric, but instead of having a 9" x 45" piece, you'd have a piece 18" x 22-1/2." Each piece is called a "fat quarter." Willow made a great photo slide show of Gizzy. It made Mom's eyes leak! Thank you SO much, Willow! Here's the scoop from Dr. ***** He says it's both good and bad. Good because Gizzy's bloodwork came back mostly normal. No problems with his thyroid or his liver or his kidneys. He hasn't got diabetes. There is no infection. It's not his teeth. The bad news is that it isn't anything we tested for; we still have no answer. It could be something else. There could be something growing that we can't feel. The only way to find out would be to do an ultrasound. Dear friends, if we do an ultrasound, then what? Surgery? Surgery on a 15 year old cat that has recently lost 1/3 of his body weight? Anesthesia on a cat that may very well never wake up due to advanced age? For what? A painful recovery period with no guarantee? Mom's heart says No. Gizzy has lived a wonderful life, and we want to keep him as comfortable and as happy as can be. Dr ***** says we can give him fluids whenever he might need them, and that Gizzy can eat "whatever he wants, as much as he'll eat, as long as he doesn't throw up." When he's ready, we'll help him to the Rainbow Bridge. Mom's gotta go now, she's leaking. Gizzy seemed a bit more chipper yesterday. He moved quicker and didn't seem quite so s-l-o-w. Here's what he told me about the visit to the vet. "It was wicked cold this morning. The snow crunched. Mom brought the silver machine near the door and let the heater run so it would be warm for me. Then I got in the jailbox and she took me outside, and put me in the car. I didn't even complain. There was a nice soft warm blanket in there. The ride wasn't long. We got out of the car, and into the waiting room. There was a big dog, and a dog about your size, Millie. It was a chihuahua named Fajita. Fajita was wearing a sweater and was still shivering! Yeah, it was that cold out. "Mom let me out of the jailbox and I climbed into her lap and let her pet me, but then another dog came in, and even though it didn't try to come close, I went back into the box. In fact, I crawled way to the back. "The box moved and we went into the room with the steel table. They tried to get me out of the box, even tipped it up, but I wasn't coming out. I may not have been feeling well, but I'm no dummy. "Still I ended up on the table and a lady picked me up and put me on a flat metal scale and weighed me. 10.4 pounds. I was over 15 in July, so I got a lot of sympathy. "That didn't last long. Next thing I knew the vet was in there, poking me all over. I growled, but she hung on tight. She took my temperature by sticking something in a place where NOTHING should ever get stuck, and I sure didn't like that at all. Then they took me away and shaved a spot on my neck! Next I got stabbed. Twice! First they took my blood! Vampires! Then a big shot of something. Then back in the box, back in the silver machine, and back home." Gizzy did his usual thing all day long, which was: find a comfy, warm place to nap and stay there till Mom gets home. Of course, he was in the window watching for the funny silver machine she calls "Astro" to come back. He met her at the door, as always, and waited to be fed. We got some nifty crunchies (In fact, everybody is eating MY crunchies) and some beef stinky goodness. He seemed a bit more active. When I tried to play he hissed (instead of growled) and fought back (instead of walking away). He was jumping better and seemed a lot more alert. Mom will call the vet about 9AM on today and find out the results from the blood tests. That should tell us what's going on with Gizzy. If he's lost 5 pounds (wasn't I 5 pounds when I got here? Did the weight I gained come from Gizzy? I'll give it back if it'll make him feel better...) there's got to be a reason, and at his age, it can't be good. As soon as we know, we'll tell you. Mom says even if she is day-hunting, she will find a way to let everybody know as soon as she can. Gizzy went to see the V-e-t this morning. He weighed 10.4 pounds, and he weighed 15.3 in August, so you do the math. The vet didn't find anything obviously bad, no big lumps or anything, but Gizzy was a little dehydrated so they gave him some fluids. They also took some blood and we'll know more tomorrow. Thanks for all your positive thoughts. Mr Karate teases Mom all the time because whenever he asks about how something is done, she always says, "It's so easy..." He gives her a silly cross-eyed look. "It's easy if you know how." Mom thought you might like to know how. So over the next few days, she's gonna tell you. Because it would be a very long blog, we're gonna do one step at a time. The first step to make a quilt is to get some fabric. (Now we're talking about kitty quilts, so we're not gonna get all complicated about measuring and stuff.) Mom likes to get fabric at eQuilter. But she also buys it from a store nearby. You want 100% cotton. When you get it home, it has to go in the washing monster, then the drying monster. Then it has to be ironed, to get the wrinkles out. This picture is the fabric Mom and her sister bought to make a crazy quilt for their Mom. You might see some of these in the kitty quilts. Next step: Cutting strips. Stay tuned. Gizzy came to us on a sunny day in July 1992. He was a tiny, scrawny, curious stray who crossed a very very busy street and hid in the bushes in our back yard. Mr Karate was only 12 when he and his friend found the cute little black and white kitten that day. He was very hungry, and the two kids fed him hot dogs. Neither of the boys' mothers' would let the kitten in the house overnight. The next day the boys went outside to play, and the little kitten was still around. They fed the kitten more hot dogs and played with him outside all day. Little Mr Karate brought him in the house to show Mom and she said, "We don't need a cat!" But he brought the kitten down the street to show his grandmother (Mom Lady's Mom). She called Mom and said, "You have to keep this cat. This is a special cat." Little Mr Karate brought the kitten back home and brought him inside. Later, he and Mom went to the grocery store to buy cat food and kitty litter. The two little boys named the kitten Gizmo, but that didn't even stick for a day before they were calling him Gizzy. Mom couldn't bring him to the v-e-t for a coupla weeks cause she didn't have any green papers. (It's the same vet, by the way, that he will see Thursday.) Vet looked him over and said he was in good shape, but he had terrible earmites and gave Mom medicine for Gizzy. She had to rub his ears really really hard to get the medicine in. The earmites went away and for years Gizzy hated people touching his ears. He had HUGE, BIG, ENORMOUS, GIGANTIC BAT EARS, as you can see from the picture Mom found. Gizzy ate and ate and ate and ate the whole first month he was here. In fact even though he was about 12 weeks old when he was found, he weighed only 4 pounds. He got big real quick. By the time he was 7 months old and had his hoo-ha-ectomy, he weighed 12 pounds. Everybody at the v-e-t fell in love with him because he was so handsome and so friendly and so mellow. Two days after he came to live here, Mom had to have an operation on her shoulder. She came home all stinky and sick, and stayed in bed two days. Gizzy never left her side except to eat and use the litter box. Once she felt a little better, Gizzy started sleeping on Mr Karate's bed. Gizzy was Mr Karate's cat. Each day he would sleep on Mr Karate's bed. When Little Mr Karate came home from school, he would run to his room and jump onto his bed. Mr Karate would land on the bed not two inches away from Gizzy. He would make the bed bounce up and down. What do you think Gizzy did? Gizzy did absolutely nothing! When the bed would stop bouncing, Gizzy would turn one ear toward Mr Karate, and open one eye, and look at him. He'd look, and look, then he'd close his eye, and pivot his ear back, and continue his nap. When he was ready, he would stretch and purr, and play with Mr Karate. In all the years that Mr Karate did that, he never landed on Gizzy, and Gizzy never jumped away. Gizzy was part of everything. He would sit next to Mom while she worked on a drawing. He would sit on the kitchen counter and watch as she cooked dinner. He would sit next to Mr Karate as he did his homework. He would purr so loudly you could hear him across the room. Gizzy had a hard time when Mr Karate went away to college, but when Mr Karate would come home to visit, the two of them played. By this time, Gizzy was 10 years old. 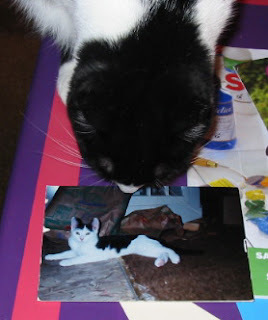 Of course before Gizzy had lived here a year, Mom and Mr Karate got Jasmine, who became Mom's cat. 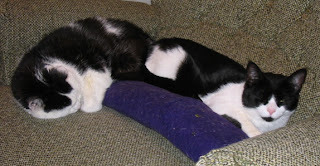 The two cats played together, but Gizzy was always Mr Karate's cat. When Mr Karate finished college, they talked about Mr Karate taking Gizzy when he moved into his own apartment, but they both knew that Gizzy was old and would probably have a real hard time in a new place without anybody around all day long, so they decided that Gizzy would stay here with Mom. Which is really good for me, because when I came to live here, Gizzy became my bestest pal. I know I am too little to have a Valentine, but he is my special secret Valentine. Mom has a co-nun-drum. I don't know what that is, so don't ask me. She wants to read all the cat blogs. And she wants to be Bizzy for Gizzy, but she can't do both at the same time. Dragonheart, Fat Eric, English Daisy and anybody else who lives overseas who wants a kitty quilt, Mom's day hunting job sends boxes ALL OVER THE WORLD. She says in order to find out how much it would cost to send a package overseas, she needs to know your addresses. So email me at darlingmillie AT gmail DOT com and we can find out. Then we can figure out the next step. Tomorrow she's gonna have the story of how Gizzy came to live here. Mom's got the blue thing going on. She cuts long strips of fabric, then sews them together, then cuts them apart into pieces she calls "chunks." Then she puts them together to make the kitty quilts. It's how she can put them together so quickly. If you biggify the picture of me with the pink fabric, you can see the "chunks" set next to each other. Mom thinks it's weird that no girl kitty has asked for the pink ones. Anybody want a pink one? Besides me? Gizzy and I are very thankful. Mom's kinda stunned. She's got so many cat quilts to make. She won't be taking naps or lounging in the sun like I will. She was kinda hoping for orders to make 6 cat quilts, but she got more than I can count. She was so surprised she spent most of the day sewing. She looked at Paypal, but she wants to ask a few of the entrepreneurial cat bloggers some questions before she sets that up. The weather guys say we're supposed to have a BIG snowstorm, called a nor'easter, on Wednesday, so she's gonna see if she can take a vacation day that day and stay home with us and sew. 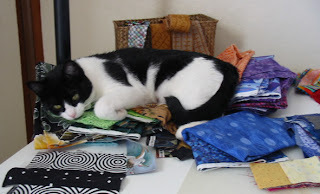 In the meantime, if you cats want a cat quilt, she needs to know if you have any particular color requests or if you want a multicolored quilt. She says she will try to meet requests on a first-come basis, but that she's trying not to go to the fabric store to buy more. Email me at darlingmillie AT gmail DOT com. That will be The Place for all information. Thanks again, and we'll keep you all informed about our wonderful Mr Gizzy. Gizzy's gonna see Dr ***** on Thursday morning. There was no earlier appointment available. But Mom musta got the right person because when she started to explain about the green papers the lady said, "Don't worry, you have been a long time client..."
You can click the pictures to biggify. Mom's gonna be very busy making these. She's hoping to get the Paypal stuff worked out tonight. Thank all of you. I gotta go get Mom back to work! She's gonna call the vet tomorrow to get Gizzy checked out. Mom's really excited about making cat quilts. Real excited. She's been busy in the sewing room all morning, and she's got a lot to do. You can see I am helping. Here is a picture of a cat quilt with greens and some yellow and blue. Mom thinks these colors might be flattering for a ginger colored cat, but since we're all black and white, we can't tell for sure. You can click all pictures to biggify. Here's one with lots of pinks and pinky purples. This would be good for any cat that likes pink or even Tuxies. She's working on another pink one right now, and I think there's a yellow one in the works. And I see a pile of blues and greens over there. Mom set me up my own email account. It's darlingmillie AT gmail DOT com. She still has to do all the Paypal stuff. If you're interested in buying a cat quilt, please leave a comment or email me. Check yesterday's post for more information. Here's skinny Gizzy. He doesn't look so manly in this picture, but that's because Mom was sticking the camera in his face and he doesn't like the flash. He's eating, and drinking, but not much. Mom's gonna call the vet and make sure he gets an appointment. Problem is, Mom hasn't got any of the green pieces of paper. So she's gonna try to make a deal. Mom wondered if she could raffle a quilt as a fundraiser. She wrote to Skeezix cause he's one of the smartest cats in the blogosphere. He said it might be hard if she didn't have a quilt already made. (And she doesn't -- yet.) But he gave Mom an idea. She is going to make some cat-sized quilts, out of pre-washed cotton, and fill them with nice warm fleece. They'll be about two feet square (of course that's not two of my feet or they'd be too small for anything), crazy patchwork on one side, and quilted a bit to hold the layers all together. Mom says they will be machine washable and dryable. She's gonna sell them and anycat in the blogosphere (or beans even) can buy them. We haven't worked out a price yet, but $25 sounds about right. And she would have to set up a paypal account or something. This way she could get the green pieces of paper to pay the vet costs and not stress out about it too much. Here's a funky black and white one. She's working on a couple of pink ones, and has some others planned with all the colors in the rainbow. Cat bloggers, would you be interested? 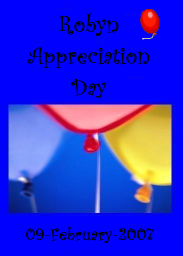 Thank you Mom Robyn for all you do for cats and the Cat Blogosphere! We think you're pretty awesome!